Participant of the International Day of Persons with Disabilities takes photos of participants attending a special event organized by the Department of Economic and Social Affairs (DESA) on the occasion of the International Day of Persons with Disabilities. Noting that national policies often tend to treat women and girls with disabilities as helpless objects of pity or allow them to be treated in that manner, the United Nations Committee on the Rights of Persons with Disabilities has stressed that, instead, they need to be empowered and allowed to enjoy their fundamental rights and freedoms, as any other person. “Policies for women have traditionally made disability invisible, and disabilities policies have overlooked gender,” said Theresia Degener, a member of Committee member in a news release issued by the Office of the UN High Commissioner for Human Rights (OHCHR). To address this issue, the Committee has issued guidance for the 166 states that have ratified the Convention on the Rights of Persons with Disabilities to help them empower women and girls with disabilities and to enable them to participate in all spheres of life on an equal basis with others, as set out expressly in Article 6 of the Convention. It also details the measures the countries should take in a range of sectors, including health, education, access to justice and equality before the law, transport, and employment to enable women and girls with disabilities to fully enjoy their human rights. The General Comment also calls on States parties to the Convention to repeal or reform all legislation which discriminates, either directly or indirectly, against women and girls with disabilities. It also urges public campaigns to overcome and transform long-held discriminatory attitudes towards women with disabilities. 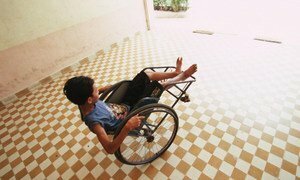 The Convention on the Rights of Persons with Disabilities turns 10. Members of the Committee talk about how impact of the convention and the challenges that still remain. The Committee is a body of 18 independent experts which monitors implementation of the Convention on the Rights of Persons with Disabilities. The members of the Committee serve in their individual capacity and not as government representatives. They are elected at the Conference of the State Parties to the Convention for a four year term with a possibility of being re-elected once. States should make their social protection systems more inclusive for persons with disabilities, rather than pursuing models that often lock them into a cycle of dependence and poverty, a UN expert on the rights of persons with disabilities has said.